Ocean processes, marine life dynamics, and human ocean use are each inherently three-dimensional and time-dependent, and each occur at many spatial and temporal scales. No single measurement system (in situ or remote) is sufficient for describing any of the ocean state variables, and a “multi-platform, multi-variable” observational approach integrated with models is required (Seim et al., 2009). ADEON combines acoustic information with contextual data from space-based remote sensing, hydrographic sensors, and mobile platforms to fully comprehend how human, biologic, and natural abiotic components create the soundscape and influence ecosystem dynamics of the OCS. 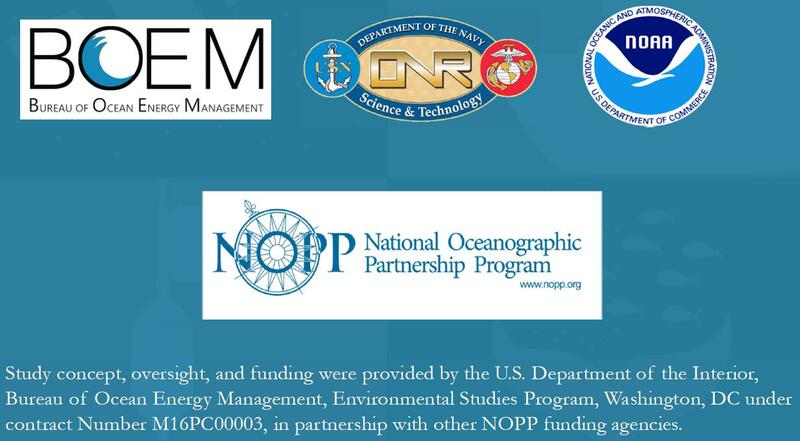 Measurements made within this research program will serve as a baseline for pattern and trend analyses of ambient sound and the ecosystem components contributing to the OCS soundscapes. Using the data collection scheme shown below, the Atlantic Deepwater Ecosystem Observatory Network (ADEON) for the U.S. Mid- and South Atlantic Outer Continental Shelf (OCS) will generate long term measurements of the natural and human factors that describe the ecology and soundscape of the OCS. This study will provide standardized tools for comparing soundscapes across regions, and predictive models for the soundscape and overall ecology of the southeast OCS in water depths between 100-1000 m over a five year period. The data and models will allow the public to estimate short-term and cumulative effects on the soundscape from changes in human activity as well as ecosystem changes driven by climate or other environmental factors. Data will be made available from a publicly-available database.